Every Tuesday afternoon I put on a royal blue hospital-issued jacket and head over to Reid’s Geropsych Department to tell stories. While most of the patients are in their seventies, the ones I meet with as a volunteer range in age from twentysomething to ninetysomething. For an hour and a half, we write stories together inspired by photographs I bring along. We imagine other lives in far off places where cowboys serenade their horses and best friends win big in Vegas. I tell stories, too, from around the world. Stories with talking animals and cruel sisters, magic wishes and fathers and their wayward sons. It was the sight of a baby doll in a basket by her feet that first caught my attention. When I ask her about the baby, Agnes explained to me that she knows it is a doll, of course…but, her voice grows quiet, “he is real, too.” One day someone came in and left him on the counter at the nurse’s station and then left. He was all alone; he might have tumbled off and gotten hurt. Well, Agnes couldn’t bear to see any baby treated that way and immediately went over to get him. “I like caring for people,” she says repeatedly during our conversation. “Yes, I can see that,” I say. What I don’t say: in a place where her every need is cared for, the need to care for others does not go away. How could it? It is one of the things that remains even as her brain cells are rapidly dying, taking her short term memory with them. This is an aspect I find particularly fascinating in my contact with people experiencing advanced dementia and Alzheimer’s. Who are we our memories fall away, taking much of our old identities with them? What quirks of our personalities or values remain? What characteristics come into sharper focus? What wisdom emerges? I got a little closer to some answers this week. When I arrived, thirteen folks had already gathered in the activity room. They were ready for a story. After we made up a tale about a time traveling musician, I decided to tell them “The Return of the Prodigal Son” from Luke’s Gospel. It is a story I have told several times, usually to Quaker and Brethren seminary students. Needless to say, the reaction this time was very different. The group, along with a couple activity therapists, listened intently while some particularly enthusiastic patients punctuated moments in the story with a heartfelt “Amen!” Something in the atmosphere shifted. 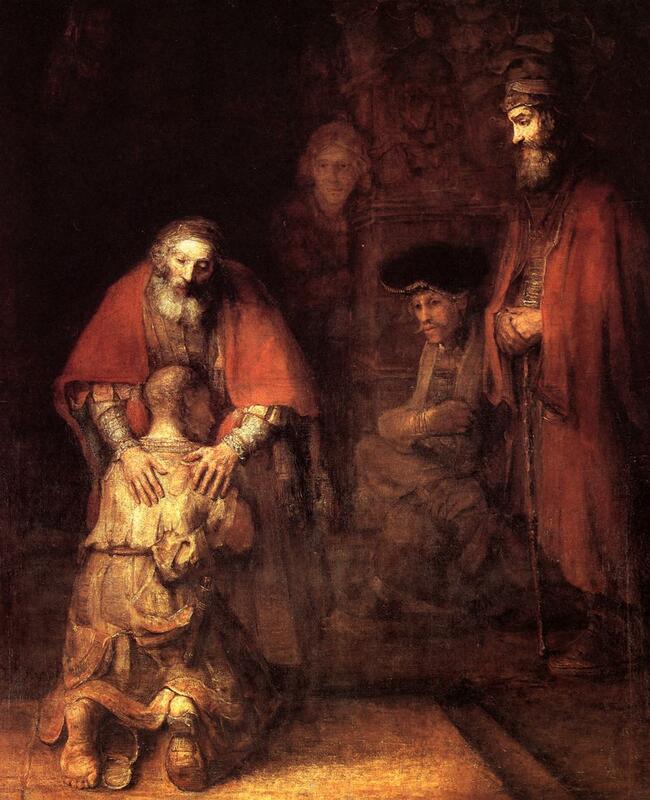 When the story was over and we settled into silence, I handed out copies of Rembrandt’s famous rendering of the father and prodigal son’s return. What do you notice? I asked. What sticks out to you? “The prodigal son’s shaved head,” several told me. It was bare and fragile, and though this was not said, it resembled some of the male patients’ own tender and ancient heads in the room. “The prodigal son’s foot,” a couple others called out. “Callused and bare, you could tell he had had a difficult journey.” Others pointed to the onlookers in the distance. The father’s embrace. What do you think, should the father forgive him? I ask. Betty was the first to speak. The 93 year-old woman spoke about forgiveness and how it meant living a good life. It was her father who taught her the meaning of the word. He would set out a neat stack of dollar bills each week on the dresser, his pledge for the church. She remembered that if her father called her by her full name, she knew she was in trouble. But that if she asked, she would be forgiven. It was the same with God. This from a woman who, later, when we indulged in a round of bingo couldn’t remember enough letters and numbers to play on her own. “Forgiveness. Nothing is more important than that,” she said. This is what she remembers. Not a single person there defended the older brother. Now I admit, there are times when I have sympathy for the older brother. After all, he has chosen the difficult, dull path of staying home. Of being consistent even when it is stifling to do so and putting others before himself. What outward display of affection or honor does he get? But Bert was adamant. It was the older son who was the prodigal one, the usually quiet, bespectacled man insisted. By refusing to celebrate his younger brother’s return, he was the one who did wrong. By rejecting his father’s plea for forgiveness, by envying his younger brother’s grace. He was the one who had strayed, Bert told us. It was one of the most moving explanations for why we should forgive, even when inconvenient, painful, or illogical. And I thought, maybe this is the knowledge that stays when others things go–at least on a Tuesday afternoon. Fortunately for me, I am able to remember even after I get into the elevator, walk out to my car and drive home. I can find the words to write it down–and share them here with you. Images: “Return of the Prodigal Son” by Rembrandt and (above) “Mommy at work” by Ben Kiffmeyer Graham.